Nobody gave ‘informed consent’ for Brexit. That’s because, in the 2016 referendum, the electorate was not sufficiently informed. There was no blueprint, plan, proposal or manifesto for Brexit. And there still isn’t. The Tory Cabinet is entirely split on what type of Brexit Britain should have. We now know more about Brexit than we knew before. And in a few months time, we will know much more, including details of the final Brexit deal. That’s why there needs to be a new vote on Brexit – so that this time, ‘the people’ can give their informed response. Based on the facts about Brexit, and not the falsities and flannel we were told during the referendum. After all, when Parliament considers a decision, it’s allowed numerous debates, and multiple votes, over many months, and it can make changes, or abandon the decision, at any stage. 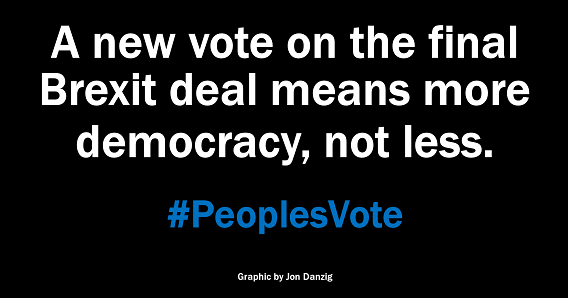 To allow ‘the people’ only ONE vote, on ONE day, on a vague idea for Brexit, without another vote on the actual final proposal, is not democratic. It’s tyrannical. If our political masters are truly interested in ‘the will of the people’ they should have no hesitation in asking us what is our will today, rather than to keep relying on what they thought our will was yesterday (i.e. two years ago). If the final details of Brexit are so good, then what have Brexiters got to worry about? But if Brexiters have so little confidence in Brexit that they dare not let ‘the people’ have any further say about it, we should all be suspicious. As suspicious as we’d be about a double-glazing salesman who won’t let us get out of the deal, even though the deal isn’t anywhere close to what was originally promised. As suspicious as we’d be about putting an offer on a house, but not being allowed to cancel the offer when the surveyor’s report details serious problem after problem. Because when buying a house, or ordering double-glazing, it’s ‘Subject to Contract’. And that’s how it should be with Brexit. Brexit is not yet agreed. And nothing is agreed until everything is agreed. So nothing is agreed. Brexit is not yet a done deal. If the details of Brexit had been agreed, we’d have voted on those details on 23 June 2016. But we didn’t have any details then. When we have the details, we need a new vote. We need to insist that Brexit is ‘Subject to Contract’ – and that we, ‘the people’, should be able to express our view on that contract when we know what it is. Remember, not one of the government’s impact assessments give any good news about Brexit. The government’s own ‘surveyors’ reports on Brexit detail serious problem after problem, and not one validated benefit. Of course, Parliament should have the final say on Brexit – because Parliament is sovereign, and we live in a Parliamentary democracy. But to help them to reach a decision, they should first ask us, ‘the people’, for our opinion on whether we really want to go ahead with Brexit, based on new facts we didn’t know before. In a democracy, as in our own personal lives, we are allowed to change our minds. Only those who are against democracy will disagree. Because a new vote on Brexit means more democracy, not less.